Lanildut: Presentation of the Vern lavoir. 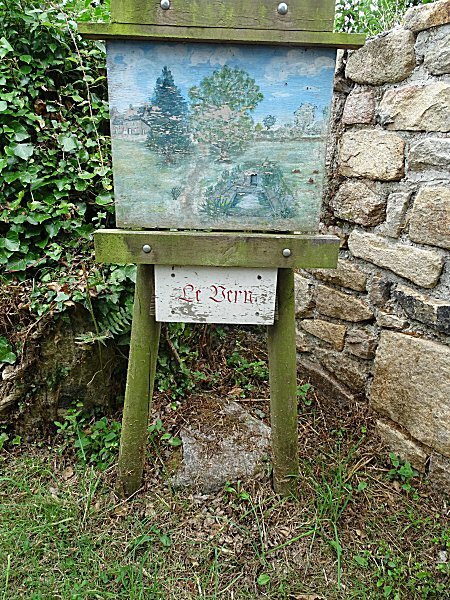 Thus, each lavoir is the object a painting, installed on easel on site. The lavoir is a very common part of the heritage in the Iroise country. So common, moreover, that the passerby usually only takes a quick look at it. Each municipality has several ones that are all similar at first sight. Since their abandonment, some of them remain buried under the undergrowth. 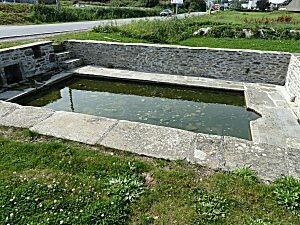 The visitor is attracted by a chapel or a manor, rarely by a lavoir, even if this one was rehabilitated by the communal employees or by a team of volunteers. Would it remain the unconscious idea that washing clothes by hand would be a degrading action? Have we established a hierarchy between the elements of our heritage? Yet this forgotten basin was particularly important in the daily life of our ancestors. Most of the lavoirs date from the 19th century because it was finally realised that dirty laundry could lead to the spread of diseases such as cholera, measles or smallpox, which were still ravaging. There were private wash-houses, which the owners sometimes put at the disposal of the inhabitants, but few public lavoirs. By a law of February 3, 1851, the State decided to pay up to 30% of the construction costs of communal lavoirs. This was the trigger for a wave of constructions that affected all the municipalities in France. But apart from the imperatives of hygiene and health, the lavoir had the advantage of combining two essential functions: one practical, the other social. 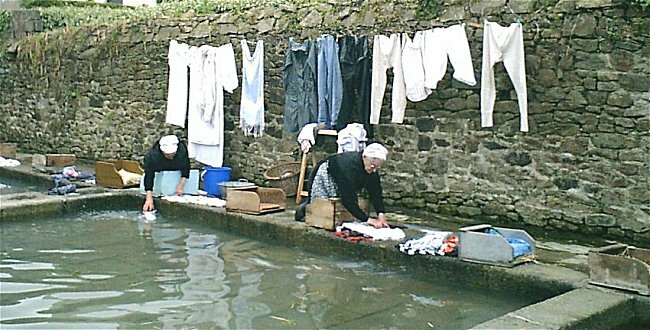 In the age of washing machines, most people think that all laundry used to be washed around the lavoir. This idea is only partly true. Let us recall how laundry was still washed at the beginning of the XIXth century. First of all, this operation was not frequent. Sheets and large work clothes were washed only twice a year during the "big wash", while the other pieces of laundry, were washed no more than once a week. Most of the work, exclusively made by women, took place at home or in the farm yard. Dirty clothes were laid flat in a large wooden tub at the bottom of which a drain that could be opened allowed the water to flow. At first, it stayed a whole day in this tub filled with warm water. The next day, after having emptied this first water, a large flax canvas was stretched over the linen. On this rudimentary sieve, a layer of carefully powdered ash was spread from oak logs or dry ferns that had been burned. This ash rich in potassium carbonate, was known since Antiquity for its cleaning power. Buckets of hot but not boiling water were then poured gently over this layer in order not to cook the stains. The linen was left soaking in this strong brew during the night. 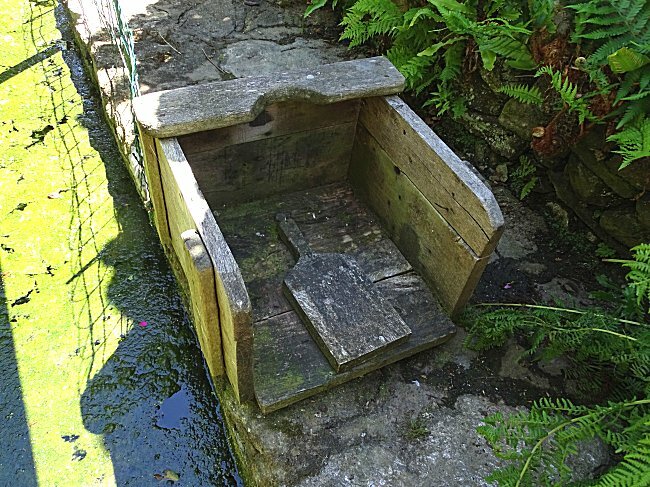 It was only on the third day that the contents of the tub were transported to the river or the lavoir, in baskets or in a wheelbarrow. Each piece of laundry was rinsed there in the clear water, beaten, and rinsed again and then wrung out and brought home for drying on the grass, on the hedge or straddling a string. 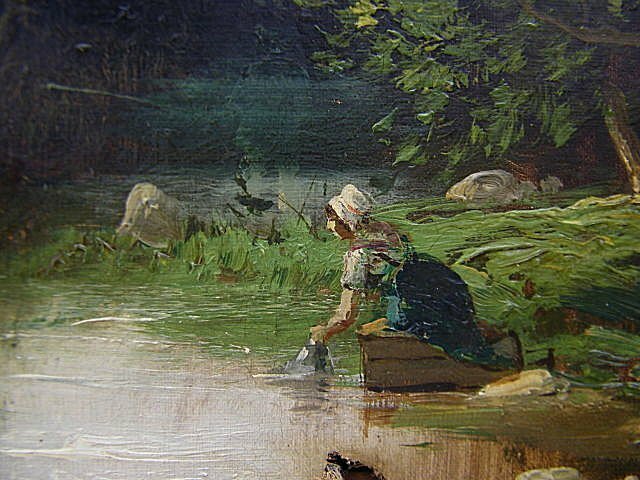 Washerwoman1 at the river, in her wash box (detail). And the soap, do you ask ? It is simple, there was no soap until the middle of the XIXth century approximately ! Or rather it was so expensive that most people could not afford it. Invented in 1856, the metallic washtub gradually replaced the wooden tub, and, as the price of soap became affordable, washing was more frequent. The public lavoirs were then set up so that they were not used only for rinsing. 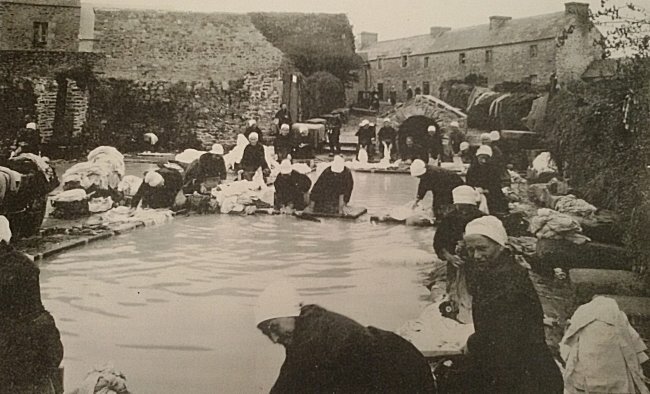 The bottom of the basin was paved, the sides were sometimes provided with benches to place the linen, the perimeter's floor was cemented so that the washerwomen could put their washing box on a flat and dry ground and were no more kneeling in the mud to soap and beat the linen. In the city, the wash house even received a roof to protect the occupants from bad weather. The social role of the lavoir was essential. It is where the girlfriends met, each with her own specific place, under the authority of the dean woman. They were laughing, chatting and the gossip was quickly transmitted2. But no more than today, no doubt, because human nature has remained the same and we must not forget that it is generally men who have spread this idea. 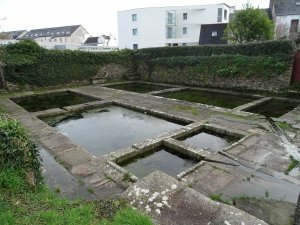 Women who could not have their young children kept brought them to the lavoir. The presence of a male adult was prohibited and in case of offense the man was sometimes assaulted and thrown into the water harshly under the laughter and mockery of the whole group. It is now clear that laundry chores were more bearable thanks to a playful atmosphere. It is this social role that gives the lavoir all its importance. It is likely that the first awareness of the injustices caused by the difficult status of women developed here at the time. Today, this element of our heritage is sometimes nothing more than a basin where the propruding eyes of a frog appear between the lenses of water. But remember that it was formerly a lively and noisy, almost festive meeting place, where the inhabitants regularly met. The lavoir represents a whole section of our popular memory. It must be respected as such, maintained and protected. In order to give these remains their former appearance, one is tempted to make these simple mineral structures as clean as they were undoubtedly at the time of their use. But times have changed and lavoirs will never regain their former importance. Rather than turning them into gleaming museum pieces waiting forever for their lost washerwomen, it is better to show them in a welcoming environment that will be respected. The example of the Kervouroc lavoir in Le Conquet and that of Le Vern in Lanildut show how important the plant environment is today. 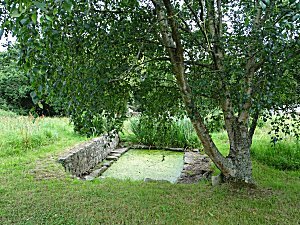 If a few herbs invade a lavoir moderately, if water lenses partially cover his pond, the visitor understands that they reflect its age. If a lawn, flowers and large trees surround it, you will fall in love with a place that is both picturesque and harmonious. And you never want what you love to disappear. The preservation of heritage also depends on the emotion it arouses. -1- Usually, the word 'washerwoman' refers more to a woman doing her job of washing other people's clothes. The word 'laundress' was also used formerly. Les femmes sont à genoux. Et pan, pan, pan, ma Doué ! 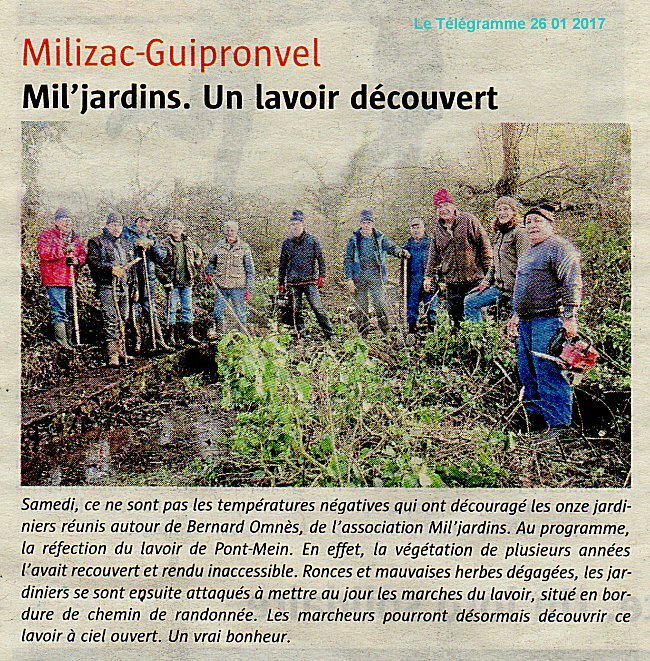 Marche vite au lavoir ! Vu le linge de la Katell ? Doit savoir ce que ça coûte. Elle est à jours, sa chemise ! On fait déjà la layette. Et le client n'y voit goutte ! Chez son voisin Mathurin ? Mes fagots et ma chandelle ! Des guenilles de la Mort. Des vieux lavoirs des clairières ! The 'doués' are the lavoirs, the basins. The 'lavandières de la nuit' were, according to legend, evil women who announced death.